Like the woodwinds, brass, and percussion sections of an orchestra coming together to create beautiful music, molasses, water, and the elusive mettle of Peter Thompson’s palate come together at Hilton Head Distillery; tested and turned this way and that in a space that strongly resembles the inner-workings of Willy Wonka’s chocolate factory, spirits emerge delightfully smooth and uniquely Hilton Head Island. 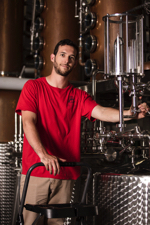 With Thompson orchestrating the opening of Hilton Head Distillery, he had the opportunity to create something that had been percolating in his distiller’s soul since his time at Clemson University. “I started making my own beer in my apartment and really fell in love with it,” he said. Majoring in management, he talked his way into a class in the biosystems engineering department on fermentation science. “I was the only person in the class that wasn’t in the engineering program. We made beer every day. I helped design and build a 15-gallon automated brewing system for the university. While I was doing all that, I started making wine too. Then from wine I went into making my own still and producing spirits in my apartment. 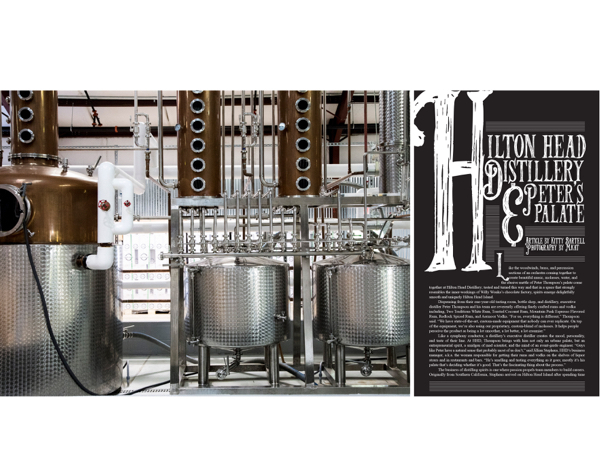 Open to the public for tastings, tours, and sales, HHD shows off not only their exemplary spirits, but their one-of-a-kind production facility, designed by Thompson in collaboration with other industry experts. The making of rums and vodka requires terms like heads and hearts and tails; it involves elements like kettles and pipes and heat and valves and plates. And at HHD, it involves carefully cultivated water. “We’re using an air water generator,” Thompson said. “It’s like a giant dehumidifier. It pulls in all the moisture from the air, turning it back into water.” Which is the only water used to make their products. Not only is the very air and atmosphere of Hilton Head Island distilled into their liquors, the low particulate level of the water makes for a higher PH, which is better for the body. Dare to say, they are making healthier liquors. Sponsoring local events like the Concourse d’ Elegance and the seafood festival, along with pop-up tastings at local liquor stores, and getting on the menu at a growing number of restaurants in the area, HHD is building a devoted following. Their facilities are also available for private events for small groups up to 100 guests, and their website is a great resource for information on their menu of spirits, including an extensive collection of cocktail recipes, tastings, special events, and tours where you will see all that cool Willy Wonka-esque equipment and learn some fascinating history. Innovation and technology inform the long-standing traditions of their craft, where the goal is a modern stewardship of a very old process. “Even when I’m developing recipes, I still go back to what they were doing a hundred, two hundred, three hundred years ago, to figure out ways I can do it, but with a modern twist.” Thompson said. 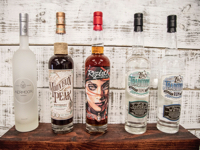 With some molasses, some Lowcountry air, and Peter’s palate, they are orchestrating some flat-out, fantastic spirits at Hilton Head Distillery. Hilton Head Distillery is located at 14 Cardinal Road, Hilton Head Island. 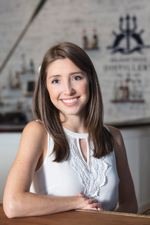 For more information, please call (843) 686-4443 or visit hiltonheaddistillery.com. OF NOTE: HHD will be releasing a dark rum on December 8, just in time for holiday celebrations and gift-giving.